The standard size for yard signs often called bandit signs or street signs is 18" tall and 24" wide and about 1/4" thick. They can come in many different sizes but the most common ones are 18"x24". Real estate agents use these signs to list information about homes or property. The material is a corrugated plastic with small flutes that are hollow. This makes the signs light weight and durable for outdoor use. Our process to make these can vary, we offer full color yard signs that are printed on vinyl and then applied to the plastic material. One other method is vinyl cut from different colors from a plotter and then applied. Creating a eye catching design is important to grab the attention of cars passing by. Having the right amount of info on the sign is also important. Having to much wording can lose a persons attention while having just enough information can be the best way to gain curiosity. Yard signs are a cost effective way to help promote your business. Placed in the right location you could catch thousands of eye balls everyday. 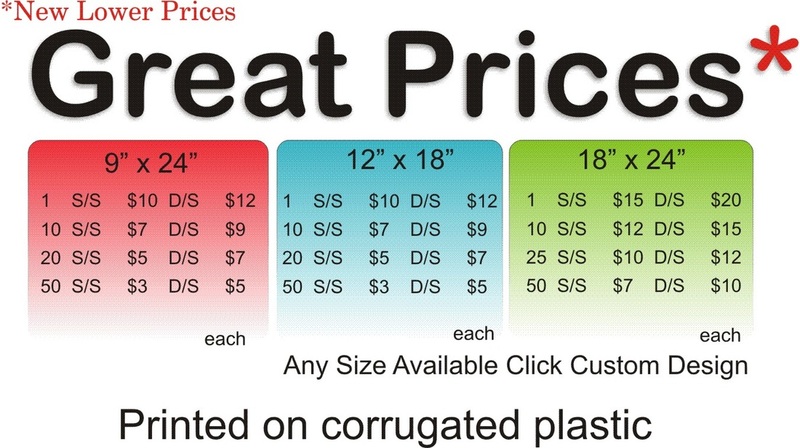 Some businesses use them for posting completed jobs or promoting grand openings.We ordering these types of signs keep in mind that the more you order the better the price per sign. We also use the corrugated material for construction signs and property for sale signs. We use a thicker material for bigger signs. The 1/2" thick material is still light weight and durable.